Ghasts are restricted to the underworld and cast caverns where sunlight never comes. Exposed to direct sunlight, they sicken and eventually die. Ghasts are cannibalistic and eat one another as well as other beings they catch. 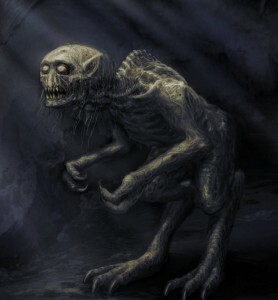 The horrible semi-human bipeds which are ridden by the highly scientific but morally degenerate humans inhabiting the cavern of K’n-Yan may well be relatives of or even be examples of ghasts. If this is the case, then ghasts are likely a result of serpent people genetic experimentation. Ghasts are evidently tamable, though very primitive and savage. A ghast is able to kick once and bite once in a combat round. Sanity Loss: 0/1D10 Sanity Points to see a ghast.